Note that the original articles contain many footnotes that are not reproduced here. In the decades since World War II, central banks in almost all countries have been printing currency without hindrance. As a result, it is not very easy to find periods of deflation anywhere. If it was in their power, central banks would make sure that no country in the world ever experiences any amount of deflation. It would then be easier for them to deny the truth. Nevertheless, Hong Kong in the seven-year period from 1999 to 2005 provides a shining illustration. 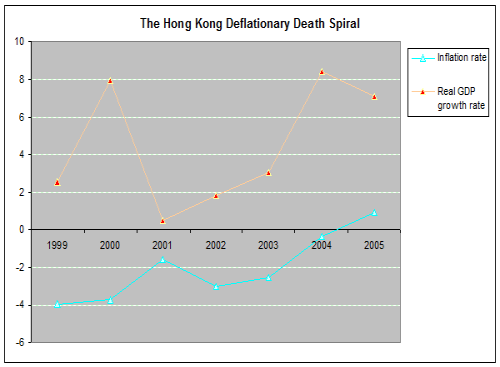 In that period, Hong Kong experienced an average deflation rate of 2%. Here is what a statist (Keynesian or monetarist) would say: ‘Oh no! People will all postpone their purchases for all time! The aggregate demand will drop! Businesses will close! Joblessness will skyrocket! Great depression, remember the great depression!!’. But, as you can see in the above chart, Hong Kong’s real GDP increased in every year of the considered period. In 2000, the GDP even increased by a whopping 8%, while prices fell by a whopping 4%! To any serious economist not employed by the government, it is not at all surprising that activity would increase when prices decline. After all, when prices decline, the cost of doing business declines. The cost of acquiring equipment declines. Thus, economic development is facilitated. At the same time, the aggregate demand increases, as people take advantage of the lower prices. Furthermore, the data shows that increases in the inflation rate cannot be used to predict increases in the GDP. For example, in 2001 the inflation rate increased from -3.7 to -1.6. A statist would say ‘Oh that’s good, the evil of deflation is going away! What a relief for us statists!’ But if you were to look at the GDP growth rate, it actually declined from +8% to +0.5% in that same period. In 2002, the inflation rate went from -1.6 to -3, while the GDP growth rate improved from +0.5% to +1.8%. Naturally, we draw the conclusion that economic activity does not benefit from increases in the inflation rate. This is consistent with common sense: a higher inflation rate means an impoverished population, a higher cost of doing business, and an increased incentive for people to conduct high-risk investments that often result in the loss of capital. None of these things are likely to make a country prosperous; quite the contrary. Had Hong Kong been using gold or a gold-backed currency as its main currency, rather than the Hong Kong dollar, it would have benefited from even larger price declines during the period, possibly -6% or -7% per year. On the following website: http://www.fee.org/the_freeman/detail/deflation-the-good-the-bad-and-the-ugly#axzz2jDzkU7dT, we can read a description of the monetarist concepts of good deflation and bad deflation. In essence, good deflation is defined as a decline in prices resulting from productivity increases. Bad deflation is defined as a decline in prices resulting from a higher demand for money unmatched by the money supply of the central bank. Allegedly, bad deflation triggers deflationary spirals where demand declines to such an extent that companies go bankrupt, leading to more demand declines and more bankruptcies. The monetarist does not explain where the vicious circle ends or what happens afterwards. He only points a shaky finger at the US Great Depression. * In the first scenario, we have a given level of consumer demand (let's call it C) and a given level of production (let's call it P). Since we are in a situation of equilibrium, C is equal to P. Now, productivity increases and P suddenly increases to P2, a higher value. Companies find that the current level of demand is not high enough to sell their current output. So companies have to cut prices in order to sell their additional output and return to the equilibrium. * In the second scenario, again we have a consumer demand C and a production level of P. Again, we are in a situation of equilibrium, so C is equal to P. Suddenly, people want more cash, so C declines to C2, a lower value. Companies again find that the current level of demand is not high enough to sell their current output. So companies have to cut prices in order to sell their excess output and return to the equilibrium. For companies, the only thing that matters is the mismatch of supply and demand. It makes absolutely no difference to them whether the mismatch is due to a supply increase or a demand decline! Likewise, companies increase prices both when the total supply declines and when demand increases. It makes no difference to companies whether the mismatch of supply and demand is due to the supply or to the demand. It follows that there is no reason to believe that a price decline due to increased savings would result in any more bankruptcies than a price decline due to productivity increases. Whenever prices decline in any sector of any economy, companies that cannot offer the product at a cost lower than the market price face bankruptcy. This is a normal part of the life of any free-market economy. Inefficient companies must give way to efficient ones. Fundamentally, the two situations of ‘good deflation’ and ‘bad deflation’ are one and the same. One could say that whenever the production level increases, the so-called demand for money (I prefer to call it demand for savings) becomes too high! In both cases, the economy just makes too much stuff that people do not want to buy at current prices. When this happens, no-one knows and furthermore no-one needs to know exactly why it happens. As a general rule, neither a company nor a government could say whether the cause of a price decline was an output increase or a demand decline, because the two situations are indistinguishable from each other and could happen at the same time. It would be totally futile for a central bank to try to extricate one factor from the other. Now, of course one could wonder: what factors could lead people to seek a higher level of savings? Since humans are all different and all lead different lives, it is really not the job of any economist to say what a ‘normal’ level of savings is or whether savings should increase or decrease. But it seems logical to think that when people are faced with suicidal government policies, such as trade barriers, minimum and maximum wages, stifling employment regulations, currency debasement, public-sector monopolies, subsidies, bailouts, high tax levels and extreme government spending levels, they naturally fear for their own future, with the effect that personal saving levels tend to increase. In this situation, a demand decline is not the disease faced by the economy, but a mere symptom of the disease of state intervention in the economy. A free-market economy would quickly respond to demand declines and output increases by reducing prices and wages, to the benefit of all consumers. In so doing, long-term unemployment would be avoided. But a welfare state would prevent prices and wages from going down, instead forcing businesses to go bankrupt and generating long-term unemployment. It would be a serious mistake to believe that savings are not important or that they should be reduced, minimised or sacrificed to the god of consumption. Savings are the backbone of capitalism; there can be no investment without prior savings. Savings are also necessary for people to be independent, for people to protect themselves from expected and unexpected difficulties and for people to buy big-ticket items. For other consumers, savers bring the added blessing of lower prices. For banks, savers provide capital that banks use to create reserves and distribute loans. But for both Keynesians and monetarists, the human desire to save is a disease! Keynesians ‘fix’ the disease by having the state spend more, while monetarists ‘fix’ the disease by having the central bank issue more money. The author of the online article mentioned above correctly blames government initiatives for the Great Depression in the US. But, being a true monetarist, he then contradicts himself by suggesting that the US Fed should have reacted to the demand decline by multiplying the money supply. In other words, the Fed should have launched a grand theft programme designed to oppress savers. Monetarists do not realise that increasing the money supply is the epitome of government intervention in the economy. There is no more solace to be found in a government's monetary policy than there is in a government's fiscal policy. Both of them are equally disruptive to the economy. First let me quickly explain the principle of the Keynesian multiplier as presented in the book of John Maynard Keynes in 1936. It is the idea that every dollar spent by the government generates more than a dollar of economy activity. The argument goes like this: every dollar spent by the government is a dollar received by the suppliers of the government. These suppliers then spend a percentage of the dollar they have just received, by buying things from retailers. Retailers then spend a percentage of the amount they receive. Thus, the initial amount of government spending continues to trickle down through various sectors of the economy. Because the economy’s output is typically calculated as a sum of transaction amounts, each of the transactions occurring along the trickle-down process contribute to increasing the output. Therefore the total effect on output of the spending of one dollar by the government is not one dollar, but the sum of all the successive spending amounts by all the suppliers in the chain. We recognise a mathematical series called a geometric series. It can be easily proven that any geometric series of the form: 1 + r + r*r + r*r*r + … where r is any real number above zero and below one, is actually equal to 1 divided by 1 – r.
So the above series is equal to 1 divided by 1 – 0.8, or 5. This means that the original one dollar of government spending triggered purchases worth a total of 5 dollars throughout the economy. This simple idea was used by Keynes to support the intervention of the state in periods of declining output (recessions). Since each dollar of government spending generates more than one dollar of output, the economy’s output and employment level can be propped up by government spending. What is Keynes saying here? In essence, that whenever a municipality or nation has an unemployment problem, it should simply raise taxes and use the proceeds to hire jobless people to do fruitless work. Taken to the logical conclusion, it means the creation of a society based on three castes. The productive caste produces food and other goods necessary for life. These goods are then stolen by the elite caste and redistributed to the idle caste for consumption. The system sponsored by Keynes is a system of enslavement similar to communism. This is the model of development Keynes preferred over a capitalist system where everyone is gainfully employed in the free market. Let us further examine the idea of the multiplier. Firstly, we should realise that the trickle-down effect does not originate from the government, but from spending in general. Therefore, any economic agent spending one dollar triggers a spending chain similar to that which may be created by a government. This means that the Keynesian theory does not necessarily support government spending per se, but spending in general. It suggests that wealth originates from spending. But let us assume for a moment that a government spends one million dollars digging holes and filling them up. What wealth did the government create? What value did it bring to the world? Did the government produce goods worth one million dollars? No – no value was created. The government only wasted, or misallocated, resources worth one million dollars. It took away one million from the free market (the productive caste) and transferred it to welfare recipients (the idle caste). Left in the free market, the funds would have been used in productive, useful endeavours like the production of goods demanded by the market. Instead, human resources were assigned to a fruitless endeavour, the digging of holes. The goods that the free market would have produced in the absence of redistribution, are not produced. Thus, the intervention of the state resulted in the destruction of value. It goes without saying that only a government could envision the undertaking of fruitless endeavours. No private-sector agent would ever consider wasting its own resources intentionally. However, a state is perfectly willing to do this, because the resources it wastes are not its own, but those it plundered from the productive caste. From this illustration, we see that the act of spending does not in itself create wealth. Only useful work creates value. It does so by producing goods that people desire. These statements are self-evident to libertarians but incomprehensible to Keynesians. As we have seen, value is destroyed whenever resources are misallocated. The main problem of the Keynesian multiplier is that any dollar spent by the government is a dollar that was stolen from the private sector (the productive caste). Once this dollar is moved into the hands of government bureaucrats, it is inevitably misallocated. The misallocation then generates a destruction of value, compared to the situation of a free market left to its own devices. All of the possible uses of capital by agents in the private sector are in fact superior to the use of this same capital by the public sector. Capital can of course be spent by private-sector agents for immediate consumption. Consumption in itself is beneficial to the agent, and it gives a meaning to the production of goods. Capital can be saved in a bank. This allows future investment by the agent, while providing lending capital to the bank. Capital can be hoarded. This allows future investment by the agent, while reducing prices for everyone in the market, to the benefit of everyone. Capital can be invested in a productive endeavour. This allows the production of goods beneficial to everyone in the market, and the potential generation of a profit for the agent. All of these possible uses are not only beneficial to everyone, but also devoid of coercion. From this last observation, we may rightly conclude that coercion and misallocation are inextricably connected. Whenever private-sector agents are coerced by the state, resources cannot be allocated properly. It should be immediately obvious when looking at unemployment rates around the world that national employment levels do not increase with government spending. As a general rule, government spending creates a number of fruitless bureaucrat jobs while destroying more jobs in the private sector. Thus, we see much higher unemployment rates in France and Sweden than in Switzerland or Singapore. The more a government spends, the more society slides (degenerates) towards a system of enslavement of the productive caste. Two further arguments can be raised against temporary stimulus programmes of Keynesian inspiration. Firstly, governments do not cut back spending after a stimulus programme. Once politicians have tasted the power, they do not let go. Therefore the idea that the government could jump in to soften a crisis and jump out when the economy recovers is purely theoretical. In reality, the state jumps in and stays there. Secondly, whenever the public sector expands, the private sector shrinks. Therefore, it is unreasonable to expect a market-led recovery after a Keynesian stimulus programme. Consumers reduce their spending in the legitimate expectation of higher taxes. Purely private companies go bankrupt or shrink down because they cannot compete against government-supported, monopolistic competitors. The intervention of the state also prevents a virtuous price decline which would naturally result in an increase in demand in the private sector. When governments inspired by Keynesian theory attempt to lure people into spending more, they are in fact jeopardising the future investment and consumption of the population. In essence, Keynesianism is the promotion of irresponsibility over responsibility, consumption over saving, and short-term thinking over long-term thinking. With these injunctions, people are lured into a form of debt slavery. For the sake of quick material pleasures, they are made to repay their debts over a lifetime. They become poorer and more dependent on state aid during emergencies. And when they fail to repay their debts for whatever reason, the government can then use the cost of debt guarantees as a new excuse to raise taxes. Modern Keynesian initiatives have two main beneficiaries: the politicians who get to meddle in the economy a little more and the banks that receive cheap funds and cheap guarantees from the government’s central bank. But for society as a whole, they are wholly detrimental. An interesting thought-experiment is to imagine what a true ‘welfare’ policy would be - in other words a housing policy intended to reduce housing prices so that the people can more easily afford that which they need so desperately - lodging. It would clearly not consist in the allocation of housing by the state to hand-picked beneficiaries, because this allocation would artificially reduce the market supply and increase the market demand. Social housing creates artificial demand because it encourages people who would otherwise have stayed with their parents or partner to move to a social housing unit, where they live alone at the cost of the rest of society. Therefore, the first order of business would be to sell the stocks of social housing, resulting in an increase in housing supply and a reduction in artificial demand. These sales should be open to anyone, not just benefit recipients, and the price should be the market price, not an artificially reduced price. The proceeds from the sales can be used to reduce the national debt, and thus the amount of money wasted every year on interest payments. If there is no national debt, the proceeds should be used to reduce tax. A true welfare policy may well include artificially high mortgage rates to discourage people from buying with borrowed money. A lower demand would reduce prices. Central banks have the power to manipulate the money market on a whim, resulting in higher or lower interest rates. The policy may include incentives for house construction. A higher level of housing supply means lower prices. Government incentives are usually tax advantages or direct subsidies using taxpayer money. It goes without saying that all arbitrary planning restrictions should be abolished. The policy may also include a requirement for people not to own more than a single house. If wealthy people are restricted to a single house, demand and prices decrease. Alternatively, the policy may include a tax applying specifically to unused buildings. Owners of unused buildings would then have an additional incentive to sell or rent out their unused properties quickly. As US President Ronald Reagan once suggested, when we tax something, we get less of it. When unused buildings are put up for sale, this creates a downward pressure on prices. The policy could also include tax incentives for people who rent out one of their bedrooms. By having several people willingly live under the same roof, housing demand is reduced, resulting in lower prices. The policy may include the reduction or, better yet, the abolition of pensions for wealthy property owners. In welfare states, state-funded pensions allow wealthy people to avoid selling or renting out their properties. Reducing or removing pensions would naturally result in an increase in property sales and lower house prices. Further, the abolition of all taxes on housing would allow people to spend less on housing, accomplishing a genuine welfare goal. Most welfare states tax people simply for owning or renting a home. In Britain, this is called the council tax. Welfare states also tax people when they buy a house, artificially increasing the cost of purchase. The policy may also include barriers on immigration in order to reduce the domestic demand. When the immigration flow exceeds the emigration flow, the number of people needing lodging increases, resulting in a higher demand and higher prices. In fact, emigration could be encouraged too, to reduce the domestic demand. Lastly, the policy may include the introduction of a sound currency like gold. A currency that cannot be printed retains its value a lot better than a currency that can be printed easily. Therefore, prices expressed in a sound currency will always be lower than prices expressed in fiat currency. Alternatively, the central bank could be forced to reduce the money supply, or at least banned from ever increasing it. When the money supply is stable (i.e. constant – not rising by 2% by year or some other number), prices naturally decline thanks to technological improvements that increase productivity. And when the money supply is reduced, prices fall because of the decline in state spending. A reduction in the money supply by the state is equal to a transfer of wealth from the state to the citizens. It is the opposite of an increase in money supply, which is a transfer of wealth from the citizens to the state. From the above thought experiment, we can see that the state would have many ways of reducing the basic housing costs, if it really wanted to. Therefore, if a country has high housing costs, like Britain and Hong Kong, we can conclude that it is something that the state wants. It is not difficult to understand why the state would want high housing costs. Politicians who themselves own houses have a direct interest in seeing house prices increase and remain high. Logically, they put their self interest above the interest of others. The claim that people ‘feel wealthier’ with higher house prices is just a poor excuse. People feel wealthier when their purchasing power increases, not when government-selected assets appreciate due to myopic government policies. In effect, government efforts to support housing demand and prices are a form of reverse welfare, or welfare for the rich. The people who are helped by such policies are not buyers, but sellers. Only in the twisted world of politics could someone claim with a straight face that he is making housing ‘affordable’ by propping up prices and flooding the market with cheap credit! It should be noted that not even a genuine welfare housing policy would be desirable for the long-term well-being of a country. The best long-term policy is a policy of completely free markets combined with a sound currency. Artificial interest rates and construction incentives both cause numerous distortions in the economy, ultimately reducing the country’s potential for economic development while restricting the freedoms of the people. People who cannot get housing should first turn towards their family and charities. Only as a very last resort they should turn to the state. For this last resort, the state could arrange cheap communal bunk bed lodging in most cities. A healthy person who gets housing for free or for an artificially reduced cost should not live comfortably, or else there would be no incentive for this person ever to get out of the ‘dependent’ situation, which represents a cost for taxpayers and a breach of morality (thou shall not steal). The natural consequence of comfortable social housing is that there is never enough social housing, and never any incentive to move away from it once you get your hands on it. France, a typical heavy-handed welfare state, perfectly illustrates the inability of the state to accomplish social goals. France steals and spends around 55% of the country’s GDP, yet it cannot even open in all medium-size and large-size municipalities an open house filled with many bunk beds that destitute people could use to avoid sleeping outside in freezing weather every winter. No matter the amount of resources they steal from innocent people, the UK and France will never manage to eliminate homelessness, simply because politician pride dictates that when the welfare state helps someone, it must provide a standard of living that the welfare state considers ‘decent’ and ‘comfortable’. As a result, when people genuinely need help, none is forthcoming.